Your four-legged fellow travelers, both cats and dogs, are welcomed at all our properties, which are in pedestrian-friendly areas, and close to parks. Moreover, most of them have private indoor or outdoor leash-free dog parks. 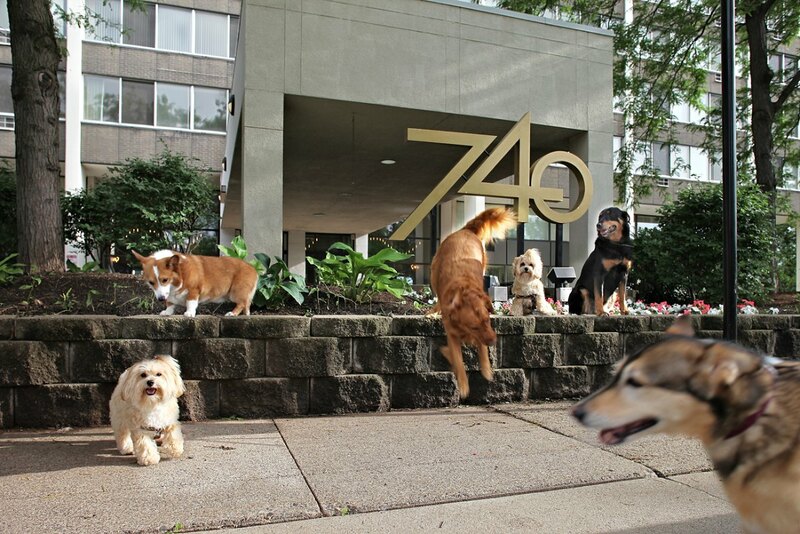 A large off-leash dog park, where your canine companion can roam free and socialize with other dogs, is a short walk from Marquette Place and One Ten Grant, in Loring Park. It is a popular destination for downtown dogs and their owners: it features a bridge, boulders and abundant space to run and play. If a busy schedule or the inclement weather makes it challenging to take your dog for a stroll outside, indoor “Hot Dogs Park” at several of our properties will let you take your pooch to a safe and pleasant environment where you can sit and read the newspaper while your dog runs about and “does his (or her) business”. Our facilities include a “Dog Spa”, well stocked with towels, shampoo and treats, where you can wash your pooch under ideal circumstances and in the comfort of your residential community. Our staff is available to make your pet’s life as pleasant as it can be. Should you go out of town for a day or two, our staff will assist you with the care of your pet, making sure that they have fresh water and food and that your cat’s litter box is clean, or to arrange for a dog walking service for your canine companion.